Confession time: I am not a cowboy. There, I said it! My Carhartts have a lot more house paint on them than cow manure. My farming background is in grains (I am a proud agro and I used to be able to unload on the fly, sort of like these guys), and dairy (I worked a couple of summers on my neighbour’s dairy farm). I haven’t spent much time in the saddle punching cows (I realize that cowpuncher is a term for a hired hand that works with livestock, but I also know that trying to move a dairy cow at six o’clock in the morning with punching is in no one’s best interest) and I’ve never roped a calf. So when our lessee at the Nature Conservancy of Canada’s (NCC's) Buffalo Valley 01 property, Ivan Thomson, invited me and Cody Barnett, NCC's then development officer in Saskatchewan, into the cab of his 1998 Dodge Ram pickup to ride the range and see his bison, it was exciting and surprisingly comfortable. Touring the 4,095-acre (1,657-hectare) Buffalo Valley 01 (BV 01) property in the Missouri Coteau with Ivan was one of my first field days as a member of NCC’s Saskatchewan Region stewardship team way back in 2014. I’d seen bison before, but probably the closest I’d been was at the Saskatoon Forestry Farm, with a page wire fence between us. I wasn’t sure what to expect. But Ivan promised to be an excellent guide, and the Coteau is always amazing, so I was ready. I mean...I hopped in, hung on and watched in fascination while bison cows, huffy bison bulls and the skittish bison calves moved in to gobble up the grain. Watching any big animal eat is exciting, but hearing the snuffling, munching and shuffling of massive bison was incredible. 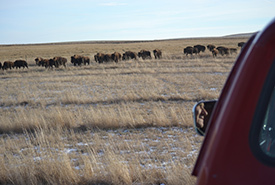 We were surrounded by groups of bison — with moments of relative calm and bursts of surprise movement as latecomers jockeyed for position while the snack disappeared. It was obvious that these powerful animals had a will of their own, and Ivan told me he never tries to move the animals unless all the conditions are right. He said if the wind was blowing the wrong way, he didn’t even bother. It wouldn’t work. This was slightly more dramatic than watching sparrows and chickadees at my backyard bird feeder, and it left an impression on me. Later that day, we sat down to a meal Ivan’s wife, Mary, prepared. The kind words, tasty bison stew and homemade rhubarb wine warmed us. It was easy to see why Ivan and Mary loved what they did. The next visit I did at BV 01 was with my friend and former colleague Dale Gross. We spent this annual inspection walking and talking about ecology, management and botany. While chasing the same mule deer up and over half a dozen little knolls and staying just out of sight of a lonely bison bull, we tossed around ideas that Dale now tells me were pivotal to him taking the leap and starting a PhD that looks at bison, livestock grazing and fire at NCC’s Old Man on His Back Prairie and Heritage Conservation Area. Thinking back to the care and attention Ivan showed his bison herd, the graciousness with which Mary served us a meal made of bison, and the hours Dale has spent researching the impact of bison grazing and fire makes me think of the different ways we interact with bison and their prairie. Generations of prairie people were Buffalo People because they depended on bison for food and shelter. Today, bison are back on the prairies in part because people appreciate the nourishment they provide. Dale and researchers like him are intrigued by how all the parts of the prairie work together to form a whole ecosystem. I know he appreciates the bison and wants to know more about how they operate and how cattle can mimic their behaviour to improve our management of remaining prairie. The research he and his colleagues have initiated may help us to improve the use of targeted patch burning and managed livestock grazing to mimic the conditions under which the plants and animals of the prairies evolved. This isn’t an impassioned plea for you, the reader, to change to an all-pemmican diet or start some sort of Saskatchewan-based, bison-themed, running of the bulls or to quit your day job and start a PhD. This is me remembering and rambling about all the different ways that bison are important. 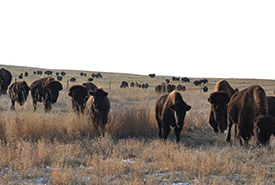 Bison ranching supports local economies and helps to protect threatened prairie grasslands. 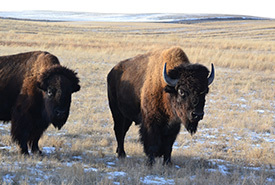 It has also taught us a lot about these animals that is being applied to conservation herds, including projects that are reintroducing bison, such as in Banff National Park. Bison are beautiful, especially on big patches of prairie. We include cattle grazing on our property because it is the best way we can mimic the important ecological role that bison play. I think the resurgence of the species is linked to all of these significant factors, and I can appreciate each of them individually and as a whole. The plains bison is one of 14 species featured in NCC’s gift-giving campaign: Gifts of Canadian Nature. To learn more and to give the gift of conservation this holiday season, click here. 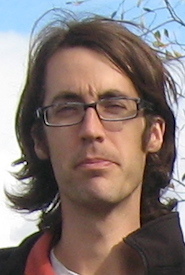 Matthew Braun Matthew joined the Nature Conservancy of Canada's Saskatchewan Region in the fall of 2014. Read more about Matthew Braun.